Do you plan on building a kit like this for the 7670 EFR? Not to speak for FR, but I doubt it. The B1 frame turbos are the only ones that can physically fit in stock location and as it is, clearances are tight and require very precise tolerance holding to ensure consistent fitment. With that in mind, it is highly doubtful that any B2 frame turbos (like the 7064) can be made to fit in stock location. Paul, you don't have to speak for Full Race... Full Race already posted in this thread that the 7163 will be the largest stock location. Is there any possibility of twin scroll housings for the smaller frame turbos? Not stock-Subaru-mount twin scroll housings, obviously; it would be silly to expect something that niche. It's not a deal breaker by any means - results so far look fantastic as is - but possibly it would be nice icing on the cake. These results look great! For that power level the spool is incredible! How would you expect the results to change if this turbo were run on a FMIC setup? How would you expect the results to change if this turbo was run on a rotated setup? +1 twinscroll housings (I understand not OEM ones) for the smaller ones. How far off is the retail release? Good Stuff. Keep us updated? Group Buy? what would you need to be done to get this turbo to work a 2011 wrx with stoçk tmic location? too bad too small for my taste. Fullrace, any plans to make a 3-bolt up-pipe as well to fit this turbo? These results look great! For that power level the spool is incredible! How would you expect the results to change if this turbo were run on a FMIC setup? How would you expect the results to change if this turbo was run on a rotated setup? For stock location turbos I prefer TMIC... less piping means faster spool better torque and quicker response. some of the available subie FMIC/charge piping kits have large diameter, long convoluted piping (spaghetti?) which can add a LOT lag and gain nil on the top end... if you are going FMIC keep the pipes as short as is possible otherwise stay TMIC! This new BW turbo looks very promising, but it's hard for me to compare to other stock location turbo's due to the fact that you need a new uppipe and downpipe to be able to run it. If someone already has an uppipe and downpipe (as many people do who are looking to upgrade their turbo), then it is getting dangerously close to rotated territory. If this turbo meets your power goal, and spool is your absolute primary concern (and you're willing to spend the money to get it) then this might be perfect. If budget/simplicity are your main objectives, then there seems to be similarly performing turbo's that would work with the stock up/down pipe. If you want big power, then you're probably looking rotated. This turbo kind of seems to fit into a middle ground. Maybe it will be perfect for some (or possibly many) people. 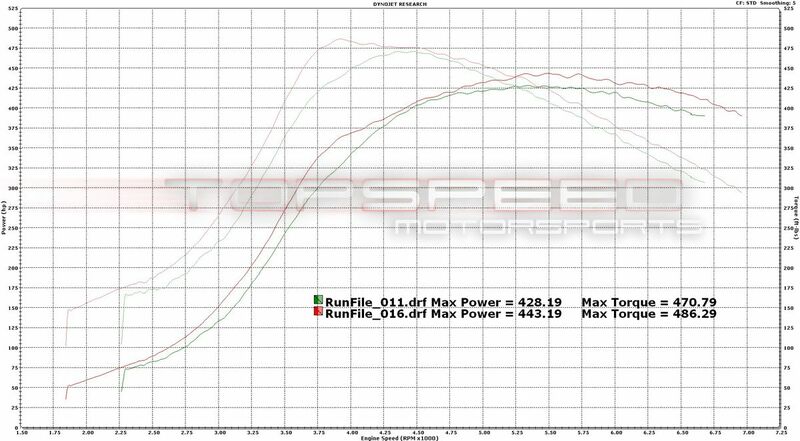 Yeah, the TopSpeed dyno plots for the Dom1.5XTR look pretty similar. Stock motor, stock TMIC as well. The TopSpeed car had a full exhaust system though. See below (note the rpm's where the two turbo's hit 200ft-lbs, 300, 400: they are basically identical). The Dom 1.5 XTR is a very fine turbo. We have installed several on customer cars and I have seen very good results from them. However, while they do spool well, they do not match the EFR7163 on the top end. Boost and airflow drops off much more than with the 7163 which held boost all the way to redline. I actually intentionally tapered off the boost a touch on my car as the stock TMIC was getting a touch heatsoaked in the 95*F temps I was tuning in. Also consider that the Topspeed dyno graph had the STD correction factor applied versus the SAE factor on my graph. Typically the STD CF adds about 3% over SAE. The Topspeed car also had a header, which I have found typically adds roughly 10whp/20wtq over the stock exhaust manifold. I think this turbo looks great. Probably better than any other stock location turbo in terms of spool vs. power. But the cost seems like a bit of a sticking point. I'm assuming this turbo will cost somewhere between $1500-1800 or so. I really have no idea, but I would guess it's in the same range as a stock location Blouch, ATP, etc. This is fine. But then you have to consider it will probably be another $1500 or so for the downpipe and uppipe from Full Race. While I'm sure they are excellent items, it is a large cost to stomach. Especially for someone who already has an aftermarket downpipe and uppipe installed. If you're going to pay $3000 or more, then why not just go rotated for a rotated (possibly twin scroll setup). I guess it all comes down to how much you value spool and how much top end you want. I honestly really want this powerband. I just think it would make more sense to go rotated and leave my options open. Would this turbo fit into a Full Race rotated setup and allow for easy upgrade in the future? Would this turbo fit into a Full Race rotated setup and allow for easy upgrade in the future? i can not confirm nor deny that... but I will say: Full-Race's subaru twinscroll kits will allow for easy upgrade to any twinscroll EFR currently available or will be available in the future. If the 7163 is eventually released in that config then there would be compatibility. Oh, also, do the B1 frame EFRs (or the 7163 anyway) still have the spot to put a speed sensor in? It doesn't look like the existing B1 size housings do, but then, that's looking at pictures on a web site... for that matter, is the 7163 still using the small frame housing? Hey Paul, good to see some info up on this 7163. Any chance you can comment on the boost transition, recovery time? Not the boost threshold that you can see in a plot, but what it feels like on the road in 2nd gear at 3500 when you go WOT. Can you really tell the difference between the lighter weight titanium exhaust wheel in drive-ability? I tried calling you a few times, but you are obviously busy. I should (finally) have a 13 STI on order, and I want to know when I can actually physically have one of these complete kits in my hands. Also, is there any way one can have your "1.5" scroll header, and then the appropriate UP to work with the SS B1 frame EFRs? -if we have to wait a while for the 7163 to come out, what are your thoughts on the 6758? I know Perrin did the one test, but the results seem skewed due to a possible TGV issue. 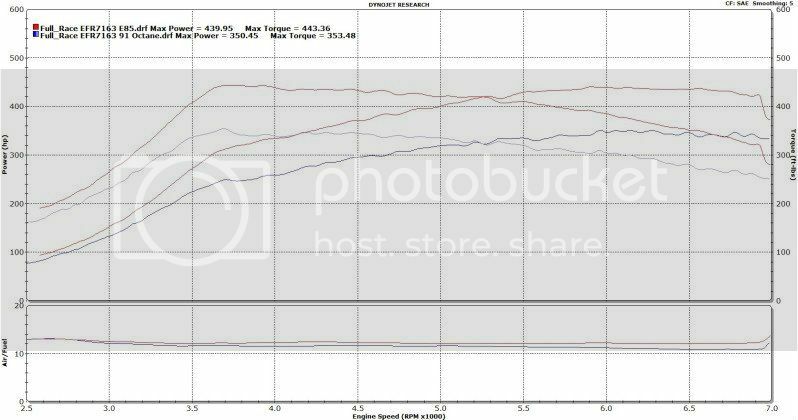 Is the 6758 (all things being equal) a turbo that will have a few hundred rpm better boost threshold, but 30 whp or so less potential? I have been waiting forever to purchase a car wanting 400 whp and Stage 2ish response, and I even spent a fair bit of time test driving used GTRs and 911s, but I think I kinda want the practicality of a STI. Please tell me I can actually buy one of these kits soon!!!!! The Efr up pipe for the single scroll probably only 300 to 400 Max and downpipe depending catted or not should be no more that 500 most people get vband down pipes custom anyway. I was just looking at these prices. +1 this turbo i've decided for my car. Thats not even an EFR Up-pipe the B1 frame is a T25 footprint and also will not have a EWG Flange since the turbo have a internal waste gate. But yea the down-pipe is pricey if its compatible and the one on this car looks nothing like the one you posted. Like I said you probably can get one custom cheaper. I know they are not the actual parts in the post. I was simply using those similar parts (ie. a Subaru uppipe and a Subaru downpipe, made by Full Race) for price comparisons.